Schoolchildren in Bangalore, India test the MultiLearn system developed at the UW, which connects multiple keypads to a single computer. 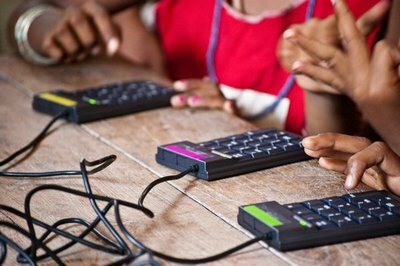 Four connected numeric keypads allow children to do math problems using the same computer. The slogan is “one laptop per child.” But it will be a long time before that is true everywhere in the world. Meanwhile, a new device aims to make a situation that is common in poor areas – one computer shared among many children – work better in school settings. University of Washington computer science undergraduates have developed a system that lets up to four students share a single computer to do interactive math problems. Early tests show that elementary school students using the tool are able to share a single screen while working on problems at their own pace, effectively quadrupling the number of computers available for math exercises. This month the team will test the device, named MultiLearn, on 180 students who are attending two government-run elementary schools in rural India. “Computer sharing is actually quite common across many parts of the world,” said adviser Joyojeet Pal, a lecturer in the Department of Computer Science and Engineering who has studied technology adoption in rural India, Rwanda and the slums of Brazil. 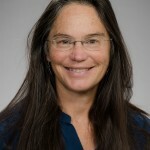 Despite the fact that almost all computers outside the developed world are shared, practically no learning technologies accommodate sharing, Pal said. In 2006 Pal worked with a team at Microsoft Research India that invented MultiPoint, which connects multiple mice to a single computer so that users can share control of the screen. “We found out that children do, in fact, learn better by having one mouse to themselves,” Pal said. MultiPoint is now used by an estimated 20,000 children and has a community of people writing open-source educational software to take advantage of its capabilities. But point-and-click with a mouse does not work well for math problems. UW undergraduate students in Pal’s computer science project course decided to try building a similar system for a numeric keypad. MultiLearn was developed over the past year by UW computer science undergraduates Clint Tseng, Heather Underwood and Sunil Garg. Their system connects four numeric keypads, each of which costs about $4, to a standard computer running Windows software. The screen is split into four columns. Each student looks at one column, where he or she is given math problems based on performance on previous answers. Early qualitative tests of the system in India, which were presented earlier this year in Qatar at the International Conference on Information and Communication Technologies and Development, showed positive results. Students Tseng and Garg are traveling this month to Bangalore, India to conduct a control trial that will compare student learning using MultiLearn with students using existing math software. Recently the original group has been joined by Leah Findlater, a postdoctoral researcher in the UW’s Information School, and Emma Brunskill, a former UW undergraduate and Rhodes Scholar who is now a postdoctoral researcher at the University of California, Berkeley. They will use artificial intelligence and machine learning to help the program adapt to individual children’s needs. Collaborators are Microsoft Research India and the Azim Premji Foundation of India, a nonprofit dedicated to improving education in government-run elementary schools. Research funding was provided by the UW’s Center for Information and Society, the Change group in the UW’s Department of Computer Science and Engineering, the UW Undergraduate Research Program, and Microsoft Research India. Watch a video of the MultiLearn project here.